In an earlier post I listed Five ways to faster learning. Now all these ideas centred around having a plan on how you are going to learn. You need to decide where you are going and how you are going to get there. All make sense? Well what are the available destinations? I hear you ask. Good question, now I could say anywhere you want and whilst that is true it’s not very helpful. If you don’t know what is possible, you don’t know what your options are. how would I create a learning plan? How do I know what to focus on first? Narrow my scope to what? Yes I can learn one thing at a time but is BufferedStreams the best place to start? Good, I’m glad I can learn more once I have some practical experience, except right now I don’t have any experience! What I need is a map with sign posts I can follow. The map needs to be something I can read. 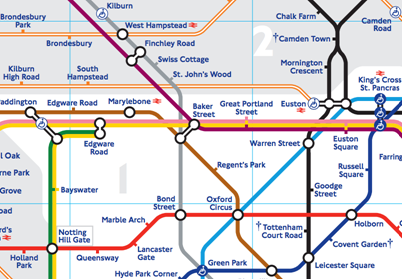 Take this tube map, if I knew I wanted to get to Oxford Circus and I was currently at Leicester Square I can see many ways I might travel to my destination. Some are longer than others and offer me the opportunity stop off and see other parts of the town. For instance I might want to go via Baker street so I can see where Sherlock Holmes lived. At least with a map I can plan my journey. If along the way I take a detour then all is not lost I can continue to navigate using the map. If I change my mind then again using the map I can plan a new route. The map is key. So where do I buy a map? I see the value of the map, now I need one!